Beamman's MME SelfBurning Effect Sets your MMD models Ablaze! Where can I get the SelfBurning Effect for MME and MMD 7.39? How can I make my MikuMikuDance model look like she is on fire? 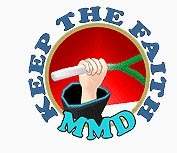 LearnMMD MME Tutorials. MikuMikuEffect has a fun way to set your MMD dancer on fire! that looks similar to the default fire effect, but surrounds a model as if they were on fire. The effect also comes with two variations, SelfFreeze and SelfDarkness! There are Japanese file names in that ZIP, so use the Applocale/7-Zip routine, if you need to, to preserve those file names as you Extract your files from this ZIP. Once you’ve downloaded the effect … and put it in your effects folder, open up MMD and load a model of your choice. Next, go to the AMP and load up whichever effect variant you’d like to use. (For the purpose of this article, I’ll use SelfBurning.x.) You may want to change the background to black, as this makes it easier to see. When you load SelfBurning, you should see a small streak of fire quickly appear and disappear between the model’s feet. Now go to the MME tab. Click Effect Mapping. You should see three tabs: Main, VertexPosRT, and VertexPos_MaskRT. 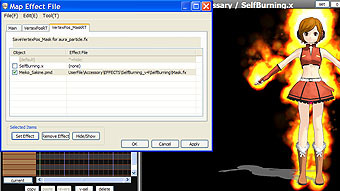 In the VertexPosRT tab, Double- Click your model and navigate your way to your Self-Burning Effect folder and choose SavePos.fx. Finally, go to the VertexPos_MaskRT tab and load Mask.fx on your model in the same way. your model should now be on fire! While the fire will be seemingly behind the model, you can go to the accessories edit box and set the draw order for SelfBurning to 0. This will completely cover the model in fire. However, I usually don’t like to do this, as it obscures their face. You can SAVE your dance. When you later reopen it, you will have to set the VertexPosRT and VertexPos_MaskRT, again, in order to start the fire! The same steps can be used for any of the other effects in the package. Pretty cool, huh? Using SelfBurning or the variants can really add some pop to your videos. I’ve literally followed those exact instructions and yet all I get is the stupid puffs of fire/darkness/ice at the bottom of the floor. I’ve loaded the vertexpos and vertexpos_mask in the right tabs for my model, but the effect doesn’t work. Just the stupid puffs at the floor. It doesn’t matter which effect I load, nothing changes. I’ve got the latest MMD already and have all that directx crap, but it just doesn’t work!! I just tried the steps… and it worked for me. I have no answer for you. Maybe Open that ZIP folder with Bandizip which keeps the unicode inside the Japanese files. What I did was go to the BSB_ObjectRT, click on the name of my model, click on “Set Effect”, then load (double click or click once and hit the “Enter” key) BSB_Object.fx to my model, and it worked. It automatically loaded BSB_Mask.fx to my model under the BSB_MaskRT tab. Then, when you’re all done, click on “Apply”, then on “OK”. That got it working for me! Hello, Pissed MMDer… I just followed the instructions in the article, downloaded the effect from the link in that article, just now. The file names were as shown in the article. I loaded the model, loaded the SelfBurning.x, and followed the steps to apply the two .fx as per the article… “Flame On!” … As you said, it must be the files from the download-source you used. Is your MME of the same 32 or 64 bit type as your MMD? Do you have DirectX 9.0c libraries installed? I’m using MMD v9.26, but when trying to use this I’ll just get an error and nothing will load no matter what. Describe how do you try to use it in lowest possible details, starting with loading SelfBurning.x. I can’t find the ‘MME’ tab!!! You have to install MME first, it doesn’t come with MMD automatically. Is there a way to only make the fire burn on a certain body part? I’m sorry, but it’s not working on my MMD. I have ver 9.10, but it’s still the same right? Well anyway, all it does is that it burns out. I folled your directions, but what shoud I do? Follow the instructions carefully. I just tried it with my MMD 9.12 and it worked just fine. When you first load the effect … the fire DOES light briefly and then “burn out”. You have to do the effect mapping as described in the article. I followed the directions and it worked OK. The Accessory Manipulation Panel (AMP) uses three ways to adjust effects and accessories. X ,Y, Z, RX, RY, RZ for positioning and Si and Tr for size and transparency. The last two are what I think have the answer to what you want to create. Is there a way to regulate fire’s thickness, for example if I want to make the fire a glove-like aura instead of a living torch?